Hi friends! I hope you're having a great day. We have NOT had a good day. I was at the doctor's office a lot today. I'm trying to get some things under control with the pregnancy. Then on the way home from my second trip to the doctor on the same day, our car broke down. Hopefully, it's nothing serious. Onto happy things, I haven't participated in Unity's Friends With Flair in a really long time so I figured I should go ahead and enter this week. I used Unity/Simple Stories Jar of Sunshine to make this card. This jar is HUGE so I figured I should make a card base of out it. 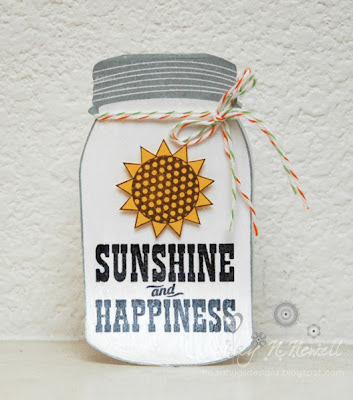 I coated the jar in Liquid Glass after I stamped the sentiment so it would be glossy like glass. Then I added the sunflower and the Divine Twine after it was dry. I'm also entering this in Moxie Fab World's Jars of Joy Challenge. Be sure to leave a comment because there's a prize hidden somewhere on the hop and you never know where it is! Go HERE to check out the rest of the hop! Have a great day, friends! Ashley, this is totally adorable. I love mason jars lately. This is a cute way to bring sunshine!! Hopefully it made you feel better after your day! Lovely card. Love that jar stamp. What a GREAT card and idea! Hope your car gets fixed quickly, cheaply, and easily. Oh, I love that you made a shape card! This is such an adorable card! Sending prayers for a safe and healthy pregnancy and baby! This is fantastic! Prayers on your pregnancy! That jar is so cute! so much fun. I love how it is so simple and graphic. Lovely. OMGoshness!!! This is the CUTEST card EVER! I hope your luck gets better with the card and Baby #3 is doing well! Hugs sweetie! Cute card...and I hope that things will be smoother for you!